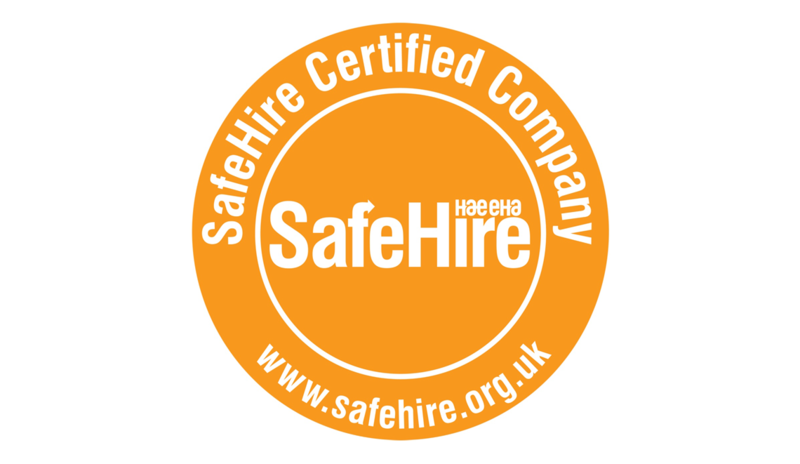 Yahire are now SafeHire certified! Along with our news a few weeks ago that we had trademarked our name, we now have another announcement which is that Yahire are now certified with the HAE EHA safe hire scheme SafeHire. Why is this so important? First we would like to tell you a little about SafeHire. SafeHire was created after a ‘Which’ report in 2010 that highlighted everything that was wrong with the hire industry. With the help of the British Standards Institute, it set out to improve conditions within the hire industry but it also helped to correct the attitude of the ‘Which’ members, who can be very influential. The impact of this disastrous report was lessened by the creation of SafeHire, which was supported fully by the ‘Which’ members. It was also established to inspire confidence in the sector and to help maintain standards. So that’s how it came about, but why is this important to you the customer? Why is certification by SafeHire important? We have to adhere to certain standards before we can become certified by SafeHire, so when we achieve this level of safety standards SafeHire can accept us into their programme. As for you the customer, you can immediately see that by Yahire being a member, we have passed all the requirements SafeHire need in order to become certified. This means that all our practices follow a strict code of safety, with standards set by the top industry experts, including HAE, its members, HSE and other corporate bodies. Our certification lasts for three years but we are subject to annual visits to ensure that we are complying with all safety and compliance standards. In order to become certified our working procedures were examined and our systems were tested by an independent assessor who has been selected for their experience of working in the industry. We were also subject to an onsite visit where the assessor questioned our employees and made sure they understood our working procedures. So you can see, it was a thorough process and we are now pleased to be a part of this industry programme. SafeHire often encounter common areas of poor work practices and can endeavour to correct these with suggestions posted in regular bulletins. They can also outline good working practices for hire companies to follow and provide guidance and support where needed. For the customer, this means that by choosing a company that is certified with SafeHire, you automatically have the backing and knowledge that we operate under strict safety standards. We adhere to good working practices and cooperate with the industry safety experts to ensure that we are always working within safety guidelines. The customer can relax and rest assured that we will always put safety and our client first and we will continue to improve with every ongoing assessment.